When the iPhone 4 launched in Canada, aside from being able to purchase the device on contract with a subsidy, Apple also released the availability of unlocked iPhones. The unlocked iPhone 3GS and iPhone 4, purchased for full price ($549/$659/$779) without a contract, provides users with the flexibility to use any wireless carrier they wish. 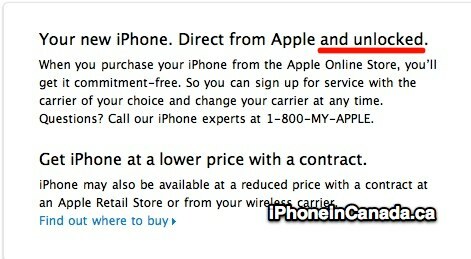 However, in the case of the iPhone 4, so long as the carrier supports micro-SIM (but you could always cut a regular SIM). When the unlocked devices hit the Apple Canada Online Store, many users were confused at Apple’s verbiage to describe the devices. Instead of simply saying â€œunlockedâ€, Apple chose to first say â€œSIM-freeâ€ which then eventually turned into â€œcommitment-freeâ€. While commitment-free makes more sense than SIM-free, the verbiage can still be confusing, especially since â€œunlockedâ€Â is mostly universally understood and the majority of Apple Retail staff are simply saying â€œunlockedâ€. Your new iPhone. Direct from Apple and commitment-free. Your new iPhone. Direct from Apple and unlocked. However, even with this small change, other areas of the store page still indicate â€œcommitment-freeâ€, so this could be the beginning of a larger, overall update.